I love horseradish sauce. There, I said it. I love the pungent and spicy spread slathered all over my sandwich. My girls enjoy it, too, which is a good thing, because I often share my sandwich with them. Or maybe they’ve learned to like anything if they’re hungry enough. But most people don’t like to think that the foods they eat could be a poison, and I can’t say I blame them. It’s not appetizing to think that your meal wants to cause you harm. But horseradish does. Horseradish, Armoracia rusticana, is a perennial belonging to the Brassicaceae family, whose other notable members include wasabi, radish, broccoli, cabbage and mustard. Horseradish is most likely native to Europe and Asia, and probably known for 4000 years, but has only been cultivated for 2000 (1). The pungency of horseradish is essentially a defense mechanism against herbivores. Plants don’t have legs, so they’ve evolved to protect themselves however they can, and the chemistry behind it is pretty cool. The defensive poison, and what gives horseradish it’s hallmark pungency, is a chemical called allyl isothiocyante. But if you’ve ever been around a horseradish plant, or fondled a root, you’ve noticed that there is no animosity towards you. No odor, no burning of the eyes, no nothing. That’s because the magic of horseradish is contained within the horseradish cells. Maybe magic isn’t the right word. Maybe grenade is better. Let me explain. When the leaves or roots of a horseradish plant are chewed by a predator, the cells are burst open and release sinigrin, a glucosinolate. When exposed to sinigrin . . . . nothing happens. But wait, also released from the cells is the enzyme myrosinase. This enzyme acts as a catalyst, or blasting cap, and hydrolyses (adds water to) sinigrin into glucose and allyl isothiocyanate. Isothiocyantes are some of the worst chemicals you can work with. They irritate your eyes, burn your lungs, smell horrible, and goes downhill from there. Every synthetic chemist has an isothiocyante story that they wish they could forget. At a neutral pH of 7, close to what your mouth is, sinigrin is converted completely to allyl isothiocyante. But if we change the pH to a more acidic 4, the intermediate aglycone (in the brackets) is converted into allyl cyanide. And this is exactly how you prepare horseradish at home: finely grate horseradish root in a ventilated space, wait a few minutes for the chemistry magic to happen, and once the desired “hotness” of the horseradish is reached, add acidic vinegar. Done. Simple as that. Pretty cool, huh? Though there is no such thing as a free lunch. That allyl cyanide can be toxic too. In the body it is metabolized and releases cyanide, which disperses throughout the body (2). This is bad, but don’t worry, you’d have to eat a TON of horseradish to have any adverse effects from cyanide. Growing horseradish is ridiculously easy, and a must for any gardener. All you need is a piece of root and some dirt. I will warn you, however, that horseradish is notorious for being invasive. It spreads everywhere if allowed, and even tiny pieces of roots will spawn new plants and growth. I’ve heard horror stories of gardeners that had some in their yard, and decided to get rid of it by roto-tilling, only to find that all they succeeded in doing was multiplying it and spreading it throughout. For this reason I grow it in a large pot inside my garden. I’ve also heard of people planting a large diameter pipe vertically in the ground, and growing horseradish inside. But don’t think think that just the roots are edible and delicious. 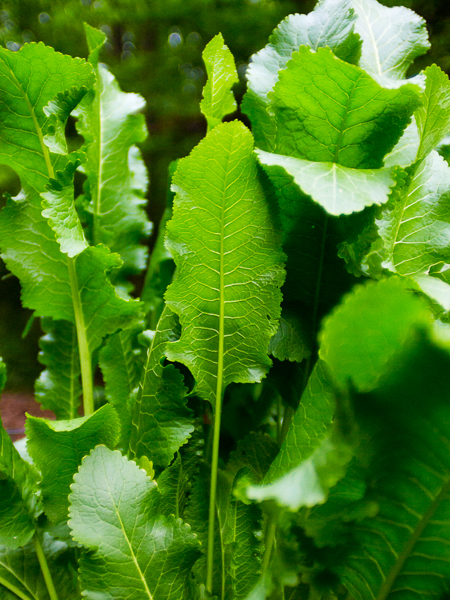 Horseradish plants produce large, lush leaves that have a strong hint of horseradish flavor. The young leaves are great chopped up in a salad or used as wraps for your favorite sandwich filling. I’ve even been thinking about making a horseradish greens pesto. Overall, it’s a great plant to grow. 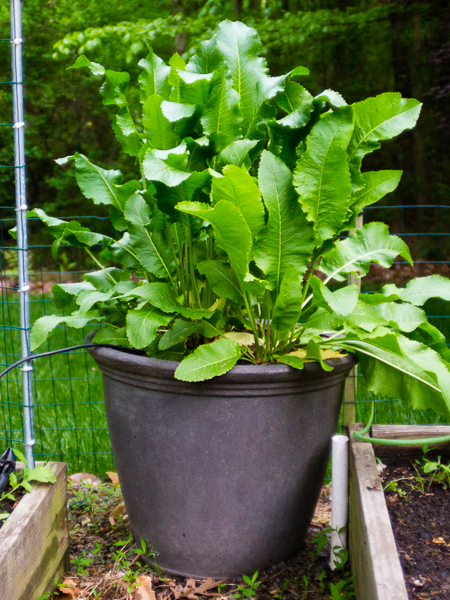 You’ve got greens in the spring – they can get a bit tough in the summer heat – and roots to process into horseradish sauce in the fall. What’s not to love? UPDATE: Be sure to read the more recent article “The True Story of Poison Gas and Prepared Horseradish“, in which I poison myself and my Dad while preparing horseradish. Good stuff. 1. Courter, J. W., and A. M. Rhodes. “Historical Notes on Horseradish.” Economic Botany 23.2 (1969): 156-64. 2. Ahmed, Ahmed E., and Mohammed Y.h. Farooqui. “Comparative Toxicities of Aliphatic Nitriles.” Toxicology Letters 12.2-3 (1982): 157-63. Tags: allyl isothiocyanate, horseradish, myrosinate, sinigrin. Bookmark the permalink. 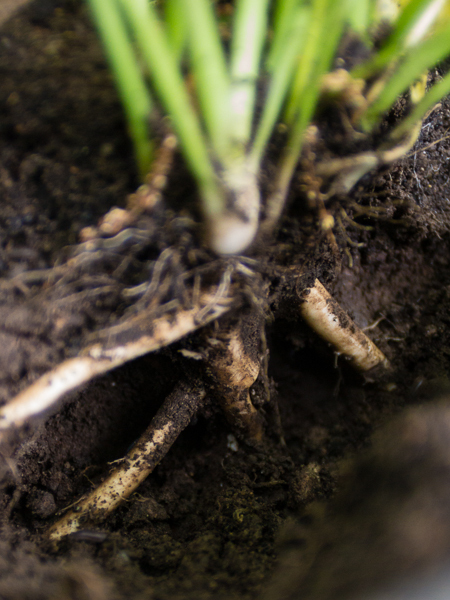 the root also stores well – for months – once dug out of ground, if kept damp and cold. So in the winter you don’t have to dig into the frozen ground, to have fresh horseradish. If I remember correctly, the company that makes prepared horseradish actually warehouses the harvested horseradish for few weeks before processing it, because it improves the taste. I love spicy food with a passion but I despise wasabi, dijon mystard, and Horseraddish. They are how I imagine a spicy fart covered in piss to taste. I could never understand why anyone would like such a thing haha. Different strokes for different folks tho I guess. Thanks for this educational article! And I like your website. I subscribed to it. I wrote about horseradish on my personal blog: http://pamspock.com/horseradish/ when I discovered a large patch of it on our new 7 acre homestead. Like you, I learned to appreciate it in a big way! I didn’t know all the details behind the chemicals in it. Thanks again. Can I buy the grocery store root pieces and grow it? question! Can we dehydrate horseradish? You can! Either slices or grated. Just Google “how to dry horseradish.” I’ve never done it myself though.